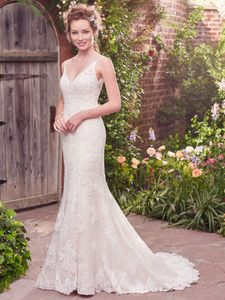 Description: Beaded lace motifs cascade over a layer of Chantilly lace in this lovely fit-and-flare, featuring a V-neckline and V-back with illusion lace trim. Delicate scalloping along the neck and hem evokes elegant charm. Finished with crystal buttons over zipper closure.